South Korean President Moon Jae-in, stands alongside first lady Kim Jung-sook as the South Korean national anthem is played at the opening ceremony of the 2018 Winter Olympics in Pyeongchang, South Korea, Feb. 9, 2018. South Korea continues to drive the Olympic peace process, amidst criticism that North Korea is only going along for the ride to ease economic sanctions without giving up its nuclear weapons. South Korea President Moon Jae-In’s persistent outreach effort to reduce tensions with North Korea helped bring about the North’s participation in the PyeongChang Winter Olympics in the South, and a pause in Pyongyang’s provocative missile and nuclear tests. In a joint gesture of reconciliation North and South Korean Olympians marched together under a special unification flag at the opening ceremony on Friday. Kim Yo Jong, the sister of North Korean leader Kim Jong Un also visited the South for the Olympics. She is the first member of the ruling Kim family to visit the South since the division of Korea at the end of World War II. While meeting with Moon, Kim conveyed an invitation for the South Korean president to visit Pyongyang for a possible leaders summit. There have only been two previous leaders summits between North and South Korea. The last one happened over a decade ago in 2007. Kim Jong Un, who came to power in late 2011, has yet to meet a foreign head of state. On Tuesday Kim Jong Un said he wants to foster the "warm climate of reconciliation and dialogue” with South Korea following the successful visit of the North’s Olympic delegation, according to North Korean state media. This easing of inter-Korean tensions is the direct result of President Moon’s diplomatic persistence and indicates Kim Jong Un's willingness to respond to constructive engagement, according to John Delury, a North Korea analyst with Yonsei University in Seoul. North Korean leader Kim Jong Un's sister Kim Yo Jong hands an autographed letter from Kim Jong Un to South Korea's President Moon Jae-in during their meeting at the presidential Blue House in Seoul, Feb. 10, 2018. “There will be many bumps along the road, but we are seeing real political will in Seoul and Pyongyang and clear messaging,” said Delury. Engagement skeptics, however, see Pyongyang’s openness to dialogue as a deceptive ploy. “North Korea is manipulating South Korea very effectively. I think before too long, President Moon is going to find that he runs into a brick wall,” said regional security analyst Grant Newsham with the Japan Forum for Strategic Studies in Tokyo. North Korea’s Olympic cooperation, skeptics say, is aimed at undermining the U.S. “maximum pressure” policy to force the North to change its behavior with increased economic sanctions and the threat of military force, without making any meaningful concessions to end its nuclear program. In the last two years North Korea has accelerated its weapons testing and made considerable progress towards developing a long range nuclear missile that can reach targets in the U.S. mainland. Pyongyang insists that its nuclear deterrent is needed to defend against a possible U.S. invasion. The administration of U.S. President Donald Trump has sent mixed signals as to its willingness to engage in talks with North Korea. 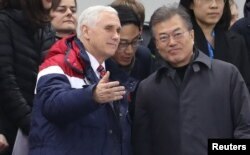 Vice President Mike Pence, who led the U.S. Olympic delegation, emphasized only the need for increased sanctions while in South Korea, and was unwilling to even greet Kim’s sister at the opening ceremony. But after returning to Washington, Pence said the U.S. might be open to unconditional talks with North Korea, while at the same time keeping up pressure through sanctions. U.S. Vice President Mike Pence and South Korea's President Moon Jae-in attend a speed skating event at the Pyeongchang 2018 Winter Olympics, in Gangneung, South Korea, Feb. 10, 2018. The South Korean Foreign Ministry on Tuesday said Pence’s new openness to talks, along with the need for continued pressure, reflects the joint position developed between Seoul and Washington. “Both South Korea and the United States have cooperated with each other to lead North Korea to the table of dialogue for denuclearization,” said Foreign Ministry spokesman Noh Kyu-duk. If the Trump administration is serious about pursuing denuclearization talks with North Korea, it will likely have to refrain from threatening “fire and fury” like rhetoric and be prepared to offer significant concessions. “You have to be ready to make real compromises. You have to recognize that the North Koreans feel under threat. They are under threat. We have hostile relations with them. And so you have to find serious ways to reduce that level of threat so you could get them to reduce their threats towards us,” said Delury. The U.S., however, demands North Korea make a firm commitment to halt its nuclear program before official negotiations to end sanctions can begin. The U.S. did agree to postpone joint military exercises with South Korea until after the Olympics to help ensure there would be no provocations during the games. There has been speculation that President Moon will seek to cancel this years’ joint drills in the spring, if the North holds off on further nuclear and missile tests. Such a compromise could reduce tensions in the short term, but could also weaken international support for sanctions enforcement against North Korea, without resolving the long-term nuclear threat. “Anything like a freeze for freeze or a postponement of exercises does cause a loss of momentum, so I am sure this is throwing the Trump administration for a bit of a loop,” said Newsham.